A portrait of one of the most famous and beloved authors in the canon of American literature—a collection of letters between Harper Lee and one of her closest friends that reveals the famously private writer as never before, in her own words. ...probably the most well-informed and clarifying book that has emerged from the Lee-industrial complex ... This closeness grants credibility to the information Flynt offers about Lee’s final years and final publication, so that while it’s a short book, it appears to answer several difficult questions ... More than half of Mockingbird Songs is comprised of the professor’s own letters, which, depending on your perspective, will either seem gracious, witty and Christian, or unctuous, calculated and personage-collecting ... Mockingbird Songs contains just enough information, just enough of Lee herself, just enough, taken all in all, to transcend its equivocal participation in the ugly and no doubt unfinished fallout of its subject’s final years. Flynt’s small collection of letters here provides a glimpse of Nelle Harper Lee in her last years, and a taste of the candor, affection, and humor she revealed to those she loved and trusted. Perhaps the quality of Nelle Harper Lee that hits readers of this collection immediately and full force is her humor. The woman was funny ... Flynt’s own understanding and admiration for the novel and the themes it evokes is both spiritual and scholarly ... This collection would benefit from having more of Flynt’s own analysis – its mixture of spirit and scholarship – informing the letters, which are instead introduced largely with anecdotes about the two families, the Flynts and the Lees. Flynt is a fluent writer in his own right, but the main rewards here lie in Lee’s tart observations on the modern world, sly sense of humor, and wonderful turns of phrase. Letters from Lee’s sister, Alice, round out the collection, which concludes with Flynt’s eulogy for Lee, a contemplation on the themes of her classic novel. Overall, the book provides a satisfying glimpse of a famously reserved literary great. 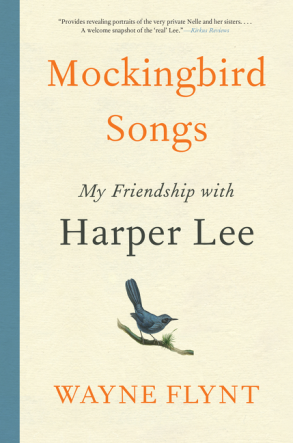 What did you think of Mockingbird Songs: My Friendship with Harper Lee?